THE CHARACTER of the Redditch Entaco side will be tested when they entertain Newport on Saturday looking to bounce back from the heartache of their final-ball defeat at Lichfield last time out. The Kingfishers go into the Birmingham League Division Three match in eighth spot but could so easily be sitting a couple of places better off but for coming out on the wrong end of the drama in Staffordshire. 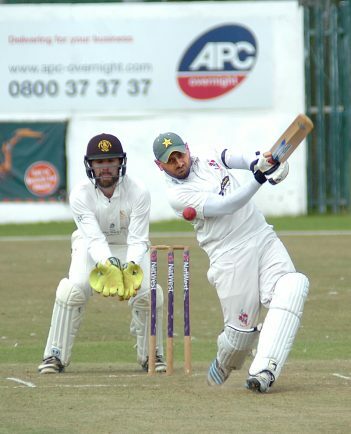 Redditch skipper Waqas Ali won the toss and decided to bat and was instantly rewarded as openers Tom Field (51) and Rizwan Mohammed (55) both scored half-centuries in an opening partnership of 91. Yassar Altar added 39 but Redditch failed to build on their good start and finished on 211-7 off their 55 overs. Lichfield started brightly and a gritty innings of 74 from opener Thomas Stone kept them in the game but Redditch bounced back with wickets through seam bowlers Ali and Ghulam Moyhuddin to put themselves into a winning position. However, Tom Swift (26) and Glen Wilson had the final say in adding 26 for the final wicket to sink the Kingfishers on the final ball of the game. Ali finished with 4-49 and Moyhuddin 3-44. The 2nds enjoyed an emphatic victory at home to bottom of the table Barnards Green. Skipper Geoff Eley won the toss and in helpful conditions bowled first, with Barnards Green collapsing to 113 all out. Teenager Olly Mason did the damage in taking 6/15. In reply Redditch wasted no time in scoring the runs as Mason completed an excellent day with 40 and Nick Fowkes chipped in with 32 to give Redditch victory by eight wickets. On Saturday the 2nds travel to Sutton Coldfield. The 3rds suffered a 63-run defeat at Droitwich who scored 200 thanks to 44 from Simon Holliday. Kevin Lokenath (3-49), Sam Bonsall (2-15) and Haleem Basharat (2-24) led the way with the ball. Redditch started brightly but wickets tumbled and the only bright spot was 59 from Basharat as Redditch were dismissed for just 137. Old Hill visit the Entaco on Saturday. The 4ths returned to winning ways thanks to a magnificent 111 not out from veteran Nev Mason, whilst Adam Sharp chipped in with 22 as Redditch scored 219-9 off their 45 overs against Five Ways. Five Ways then struggled against some tight Redditch bowling and only Naqeeb Majid with 35 offered resistance as Jacob Ottley took 3-7 and Rob Pegg 2-38 in dismissing Five Ways for 111. On Saturday Redditch, now inside the top three, visit Enville.